This red-colored vegetable is originally from North America and now is grown in almost all the parts of the world. Beetroots are said to be one of the healthiest vegetables that belongs to roots and tubers family of foods. 1. Weight watchers can consume this vegetable keeping in mind the following aspects. 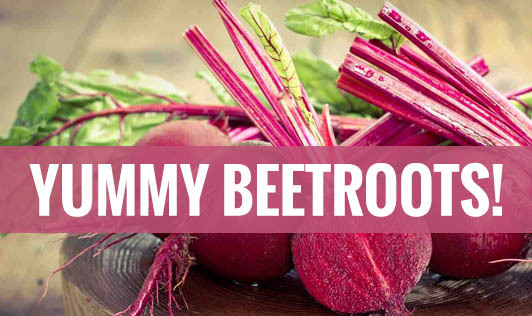 It contains about 0.1 g of fat, 8.8g of carbohydrates, 1.7g of protein, and provides about 43 kcal for every 100g of beetroot (approx. a medium sized beetroot). A diabetic can eat this vegetable occasionally. 2. Beetroot is rich in antioxidants and nutrients like magnesium, manganese, potassium, and vitamin C, and hence can be eaten by children to increase their intake of vitamins and minerals. 3. Beetroot juice is said to increase the hemoglobin level of individuals with less iron in the body. Beetroot provides about 6% of the total iron intake for a day. However, Beetroot alone cannot help in increasing the iron levels in the body. It has to be combined with other foods. 4. It can be a good vegetable for a person with a low BMI (body mass index). Consuming beetroot in their daily menu in different forms can help an underweight person put on weight in a healthy way. 5. Beetroot juice is helpful for athletes and for a person with a high physical activity level. 6. It is said that beetroot juice detoxifies the liver and also cures diseases of the digestive system because of its high anti oxidant content. 7. The red colour of the beetroot is said to increase skin glow. It is applied on the skin as a face pack in the grated form or rubbed over the skin for some benefits. 8. Many researchers say that beetroot helps in controlling blood pressure but there are no authentic evidences for the same. • Boil the beetroot, cut them into pieces and add a little tadka (oil + jeera) to it to make a good match as sabzi with all Indian breads. • Beetroot juice is very popular and it can be made with pepper and salt, jaljeera powder, chat Masala, oregano etc. • It can be roasted or grilled and added to cold salad with olive oil and vinegar which gives an awesome taste. • Beetroot halwa (a sweet preperation) is one of the famous dishes in India. • Beetroot can be added to Indian breads in grated form to increase its nutritional value. • This can be added to any preparation to give a natural colour to food. Include this vegetable in your diet at least once a week to obtain its wonderful benefits!